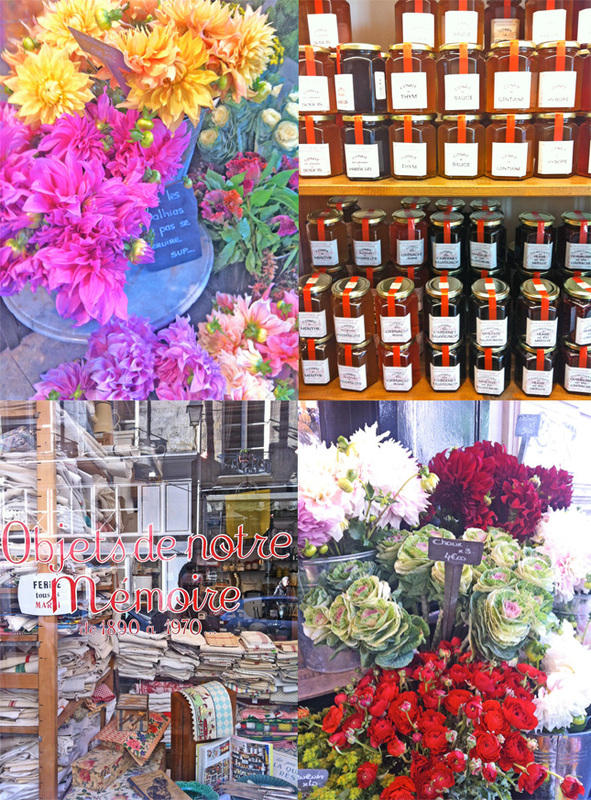 If someone asked me to describe Paris in three words, I'd say: love, food, style. 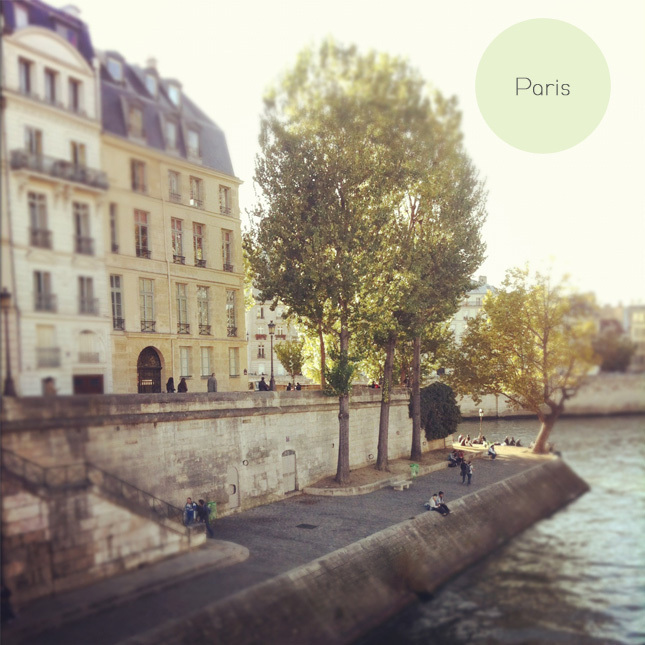 The first word describes an utterly personal reason, the second word my big weakness in the city of lights, and the latter summarizes a variety of factors that make this city one of the most charming places in the world - from fashion, to architecture, shops, and Parisian lifestyle. Since I'm a frequent traveller to Paris (referring to reason one), I decided to show you another impression of the beautiful city on the shores of the Seine. Actually, I thought it might be a good reason to take you on a little happy stroll through Paris - chasing inspiration on-the-go. So here we are, starting off from the enchanting Ile St. Louis down to the old parts of Paris like Le Marais and St. Paul. I snapped a few pictures for you and hope you'll follow me along. 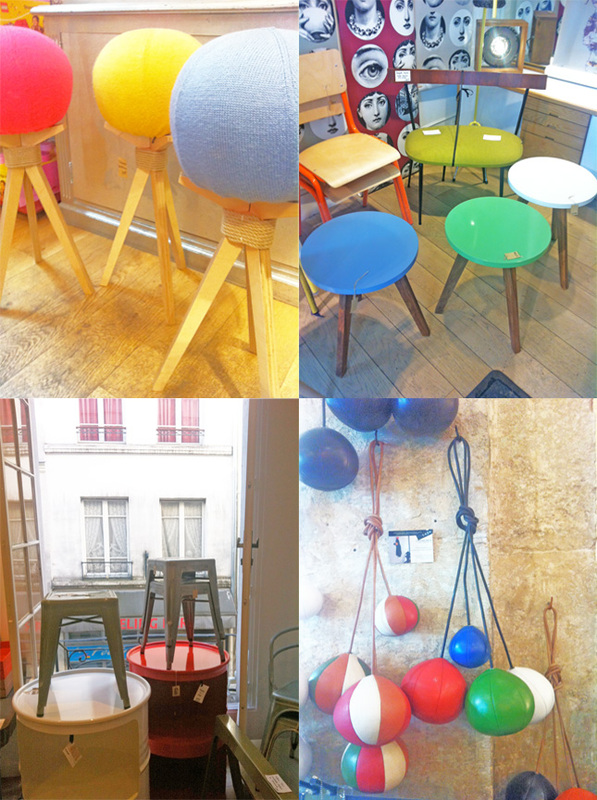 This time, I spotted so many vibrant colours and textures in interior shops (especially in the two beautiful stores of Fleux in Le Marais), not to mention the fresh flowers and luscious food displays. Plus it was an amazingly sunny and warm October day - what else to say then: I was totally happy! When it comes to architecture and facades in particular, I have a soft spot: I love brickwork. 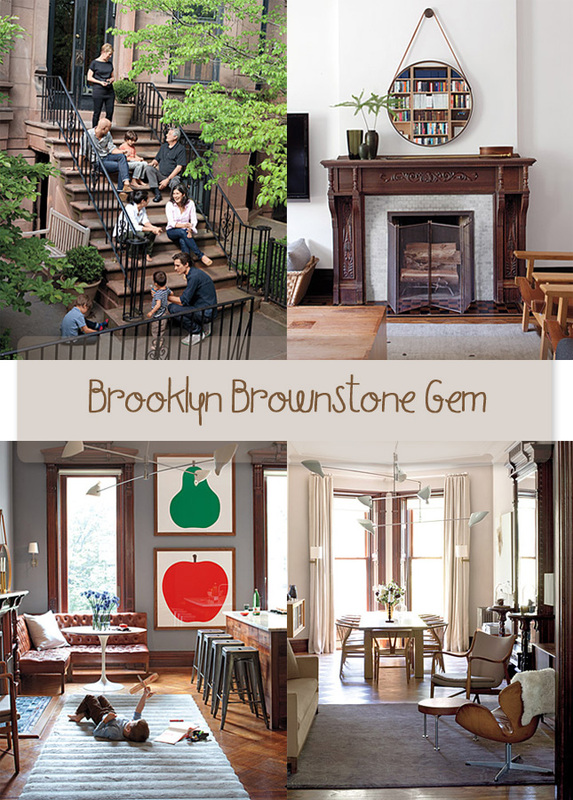 Thus, I fell instantaneously in love with this Brooklyn based brownstone building. Munich, the city I live in, lacks brownstone buildings. For lovely brickwork I need to travel to the country's north, to cities like Hamburg, Bremen, or Hannover, where Holly from Decor8 lives (one of my sources of inspiration). In this amazing example, the owners managed to transform this house into a real family-oriented home and revamp its interiors with a tasteful mix of modern and classic furniture and home decor. Can you believe the big living space and kitchen were a parlor? I love the consistent colour theme with earthy browns and natural hues and how cool are the huge illustrations of the apple and the pear? There is another tiny little highlight for me: The wooden monkey figurine by Danish designer Kay Bojesen. Simply adorable! I love tiny details that catch my attention. Seriously folks, is there a happier day than Friday? With the weekend ahead I am getting in a really happy mood. Whatever the plans - shopping, meeting friends, cinema, museum, blogging, or just relaxing and staying in - weekends inherit the power to boost and regenerate our energy and get us all ready for new adventures. 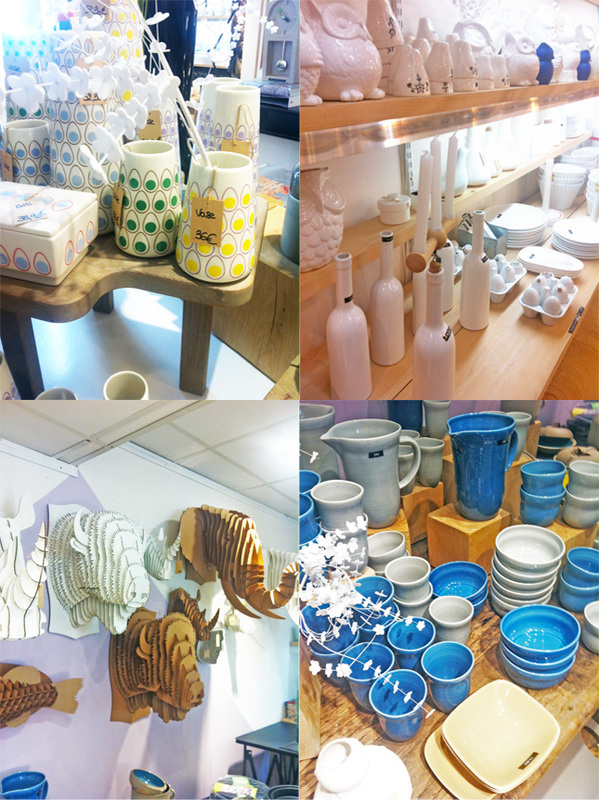 Oh, not to forget: weekends are always a great period of time to stock up with some beautiful accessories for your interiors. 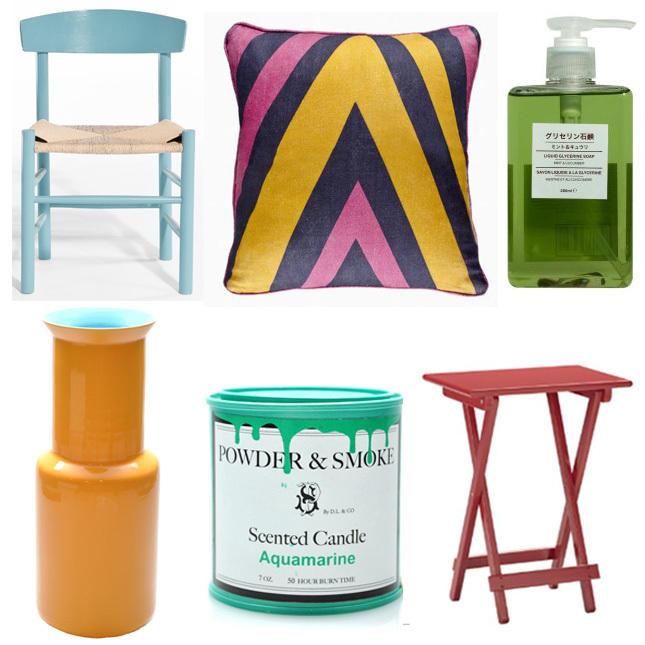 I've compiled a little weekend product moodboard for you. 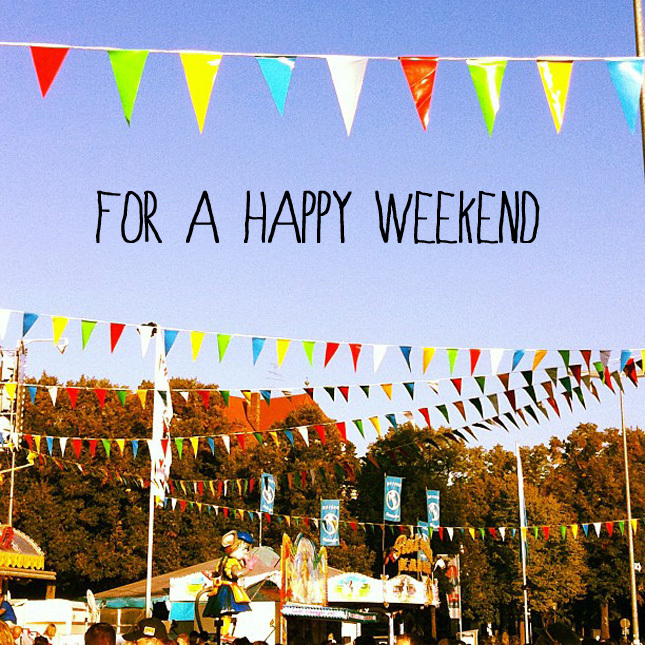 Happy weekend, friends! 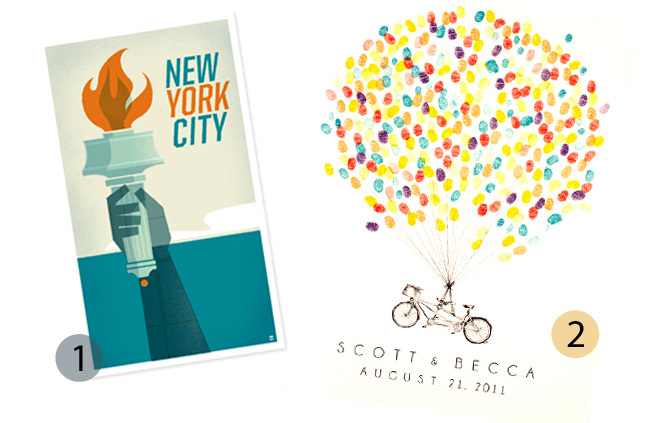 I’d like to live happily ever after with...arty illustrations! Tight budget, limited space, no time. Constraints that often challenge our inner desire to reinvent the space we live in. At least I am constanly faced with those restrictions. 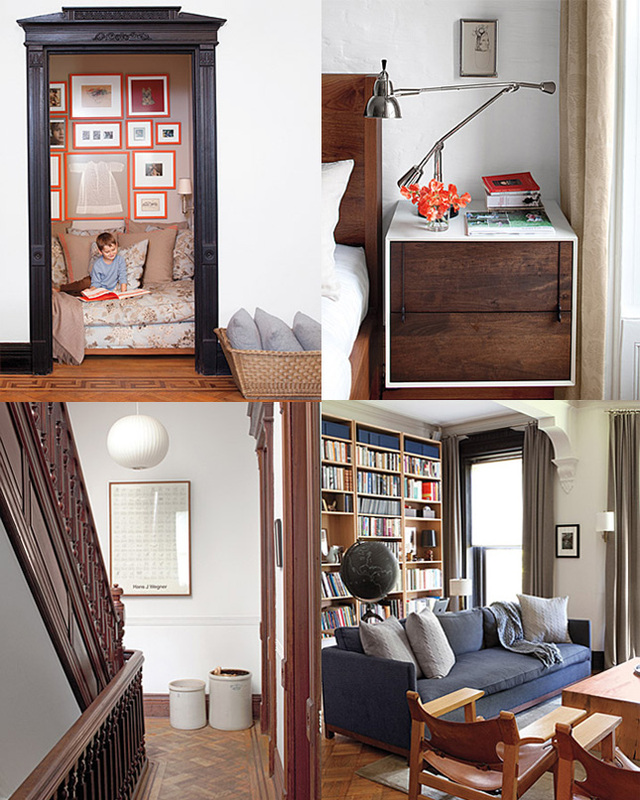 However, there always seems to be a way to appease my inner thirst for interior bliss. Like arty illustrations. 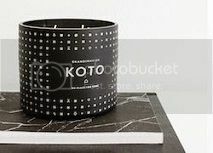 I love how easy it is to add a tad of sophistication or humour to any kind of interior – from romantic over rustic to urban. I personally love the use of retro designs, carefully chosen colour palettes and whimsical illustrations to evoke interest and to weave in a pop of colour. I do have a few at home by myself and I can hardly beat my desire to acquire new ones. 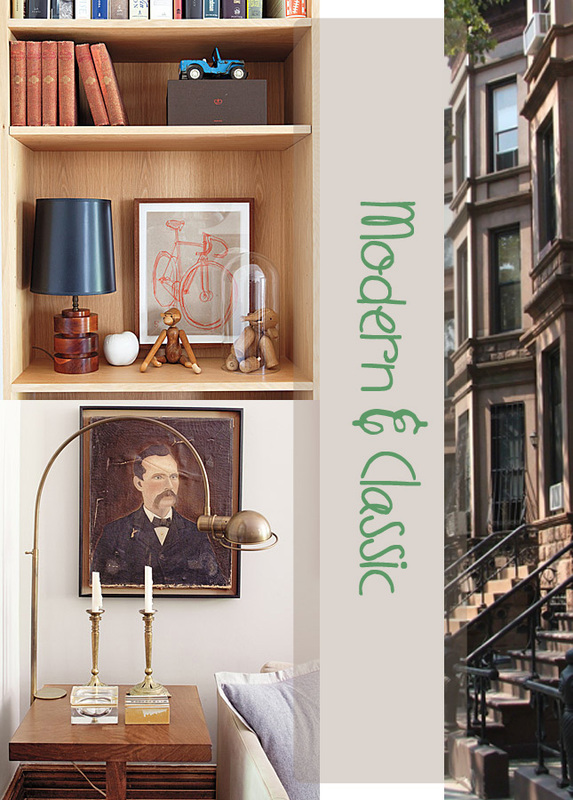 With illustrations you get triple interior fun: First, the adventure of spotting and choosing one, second the fun of picking a suiting frame and framing the artwork (you can add so much drama with adequate framing), and last but not least the fun of deciding for the right spot in your home to feature your latest arty finding. There are so many beautiful examples out there – here I’ve made a little selection of some of my highlights. Currently, Etsy is one of my main inspiration sources for colourful, arty illustrations, and Swedish artist Therese Sennerholt for sleek and eye-catching black and white illustrations. 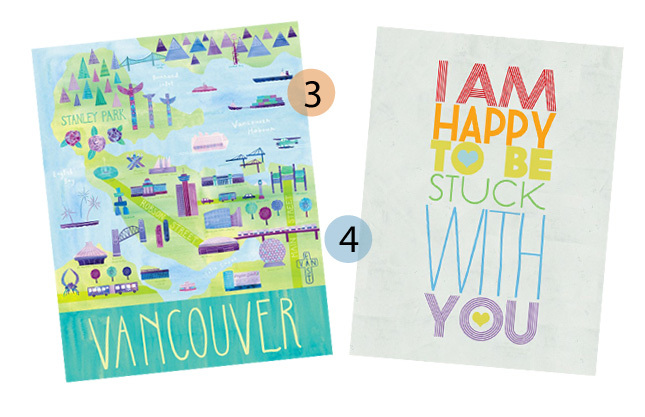 Do you like to decorate with illustrations? 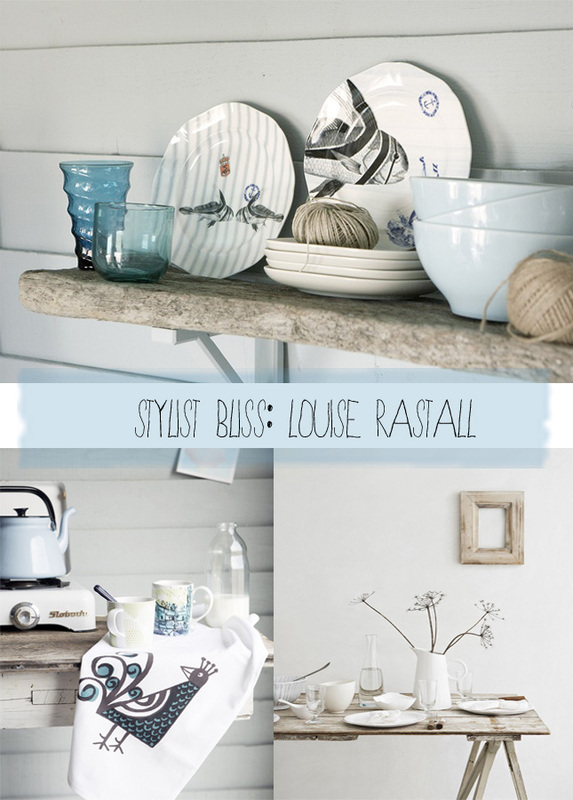 Today I want to present the work of interior stylist Louise Rastall. When I stumbled upon her website I sort of had this kind of blogger feeling that I need to put this down in a little blog post - and here I am. 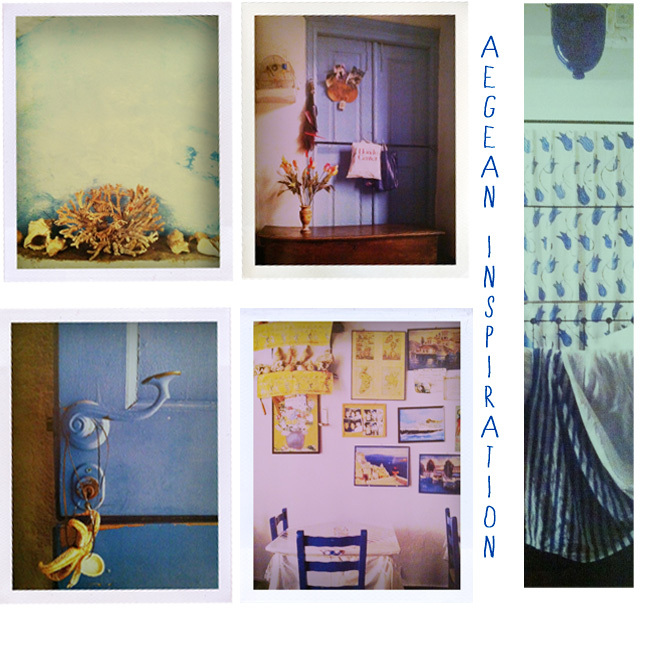 I used some of her wonderful pictures to showcase her refined approach to interior styling. She manages to convey props into an interior style story by arranging them beautifully - and by the magic of photography art she definitely makes me dreaming of a beach cottage or a vibrant retro inspired home. No wonder she worked for renowned clients such as Ideal Home, John Lewis, and Marie Claire. Find more information on Louise Rastall and her work here. 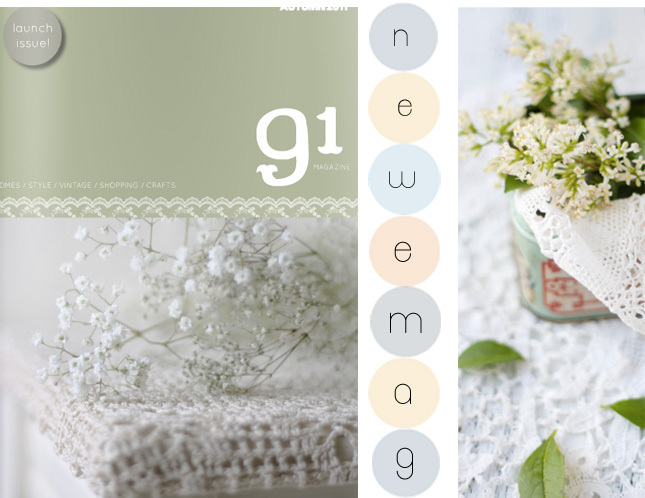 The success story of e-magazines continues: The latest beauty in a range of inspiring e-mags is the UK based '91 Magazine' published by Patchwork Harmony. 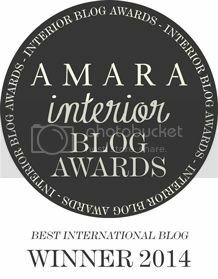 The cover already guides the way to a happy and delicate journey through interiors, design, crafting, and styling. Pastel hues, delicate patterns, and adorable photography dominate the launch issue and pursue the concept of inspiring its readers to more attention towards the beautiful things that surround us. Browse through 54 pages of creativity and ideas here. 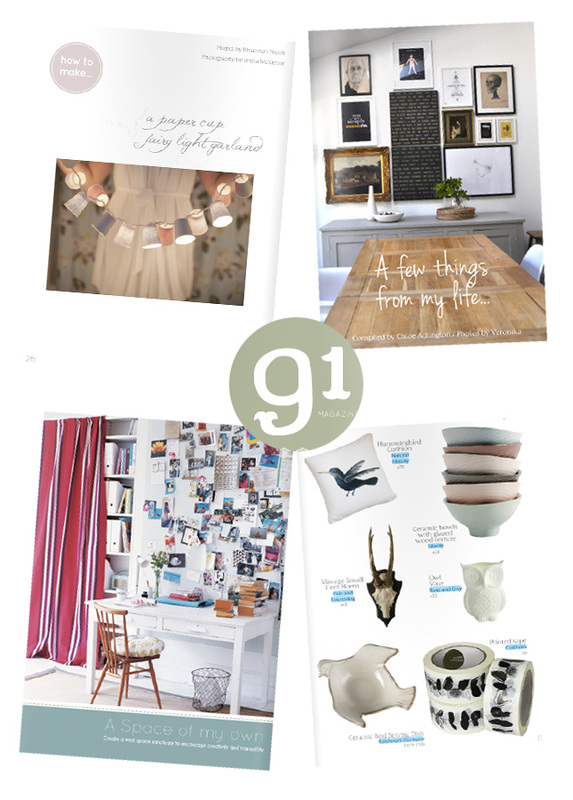 My personal favourite in this issue: the wonderful home tour starting on page 35! 1. Flipping through the October issue of Ideal Home I got hooked on Marks & Spencer’s Lyon coffee table. Which, by the way, would perfectly match the zigzag rug! 2. This zigzag rug by Urban Outfitters triggered an idea on how I want to restyle my living room for the coming season. 3. This quirky cloth rack made of handsewn leather balls on strings is such a cool idea for an urban interior. 4. How about a lazy Sunday morning in bed? Sounds fine to me – with this great Eivor bedlinen from Ikea. 5. 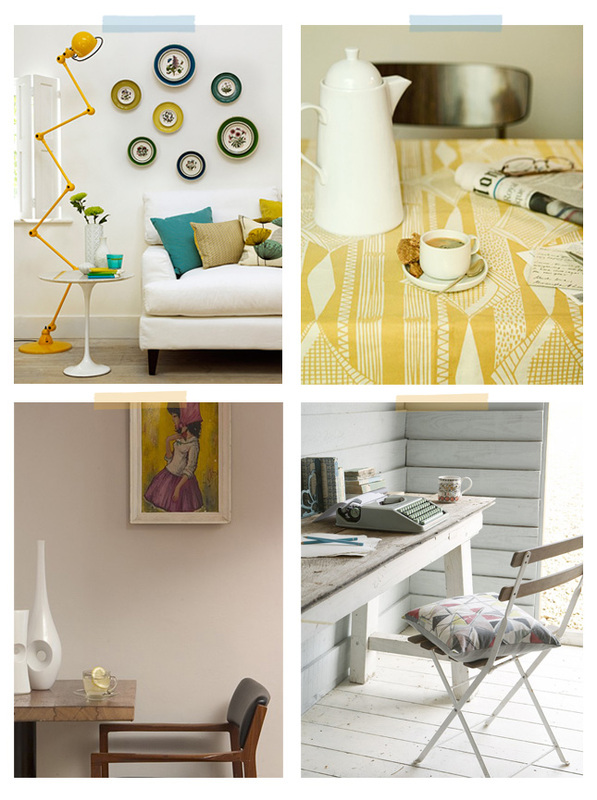 I am a huge fan of Minimoderns’ Whitby collection so I went all frenzy when they announced the matching porcelain. Loving "Decorate // Lust auf Wohnen"
I'll say it straight away: I am so lucky to be friends with some of the most wonderful, inspirational, and successful design bloggers like Mr. Bazaar aka Will Taylor from Bright.Bazaar or the one and only Holly Becker from decor8blog. Last week, I had the unique opportunity to meet Holly for the very first time in person right here in Munich. 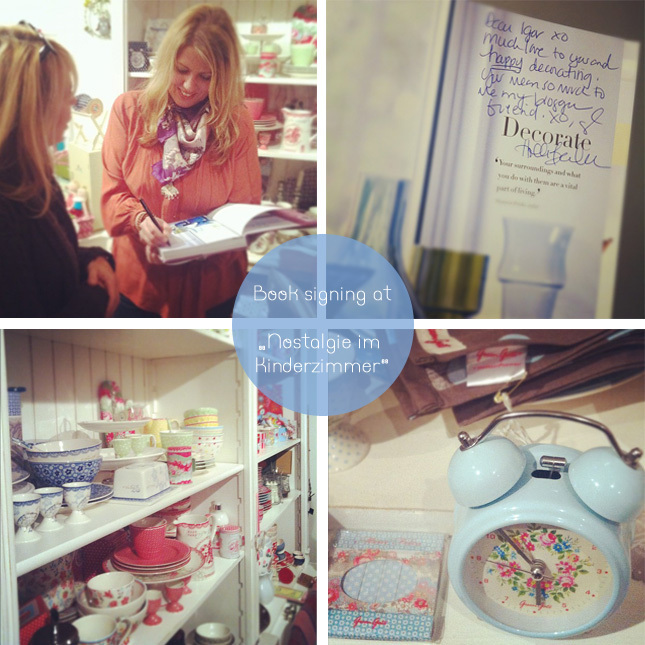 She was over to launch her best-seller Decorate as a German issue (Lust auf Wohnen by publisher Callwey) and hosted a little and intimate get-together of creative people in a cute little store named Nostalgie im Kinderzimmer. 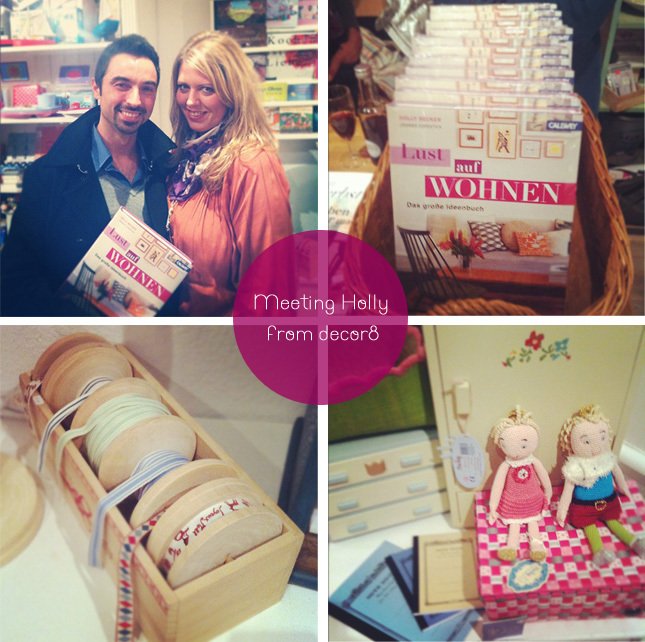 I was so happy to finally meet Holly in person. We've known each other for a year through Twitter and Facebook and it was incredible to meet face to face. 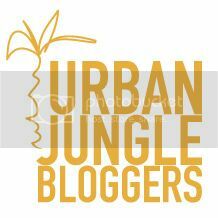 It felt like we'd known each other for a long time and instantaneously we felt like real blogger friends. 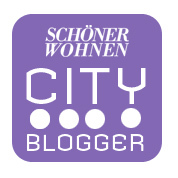 We joked around, posed with our iPhones for Instagram, and had some interesting chats with other guests regarding networking and the German blogger scene. Moreover, Holly's husband Thorsten was there (who also happens to be one of my online teachers over at Blogging Your Way) so I used the opportunity and chatted with him on photography and copyright issues. Very interesting and lots to learn! I also happened to meet some interesting guests like the wonderful Eleanor from e.m.papers, a super creative American stationery designer living in Munich. Despite the fact that I was in such a rush due to my daytime job, I so enjoyed the lovely get together with Holly, Thorsten, and their guests and even got my Decorate copy signed. Bliss! Images from Taschen "Living in Greece"
It’s only been a few weeks ago that I've come back from the sun-spoilt Greek island of Rhodes. I love travelling the Greek islands. Back in my university time I spent a year studying in Athens and ever since I’ve grown accustomed to Greece, the Greek people, language, food. 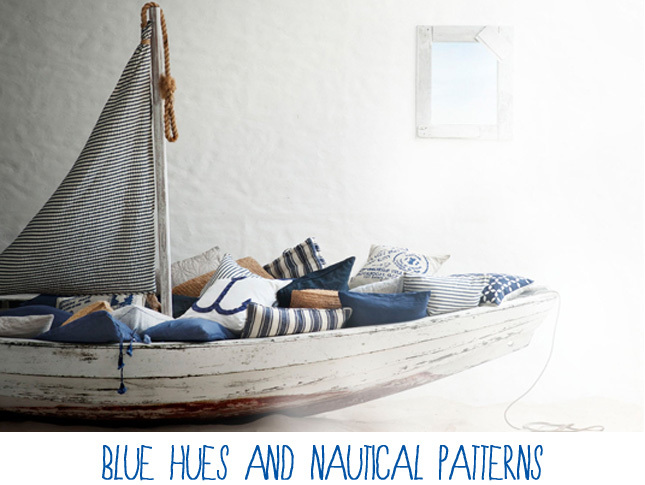 And taking into consideration my soft spot for maritime home decor, it was more than clear that the very first ‚From Place to Space’ blog post had to be about Greece. 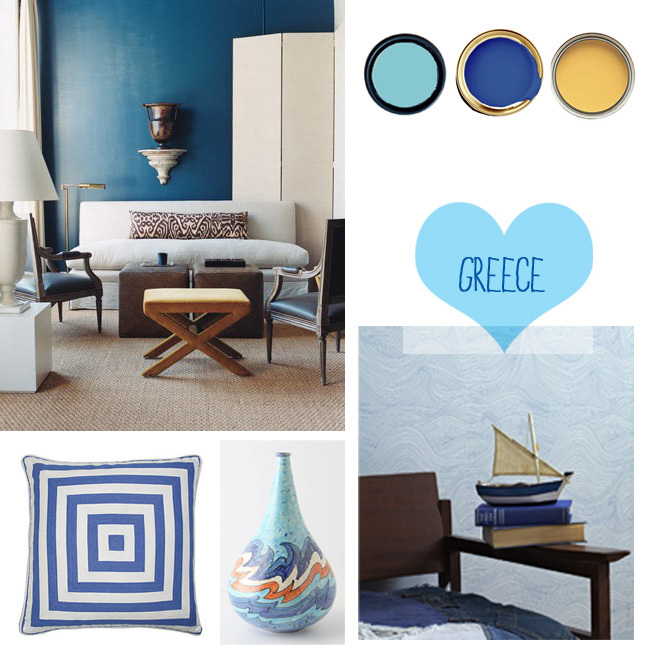 What I love about Greek styles is the use of stark, bright colours that seem to be even a tad brighter than anywhere else due to the very special light that illuminates everything in a unique way - from nature to worn surfaces and hues. The light adds a notion of timeless elegance and beauty. 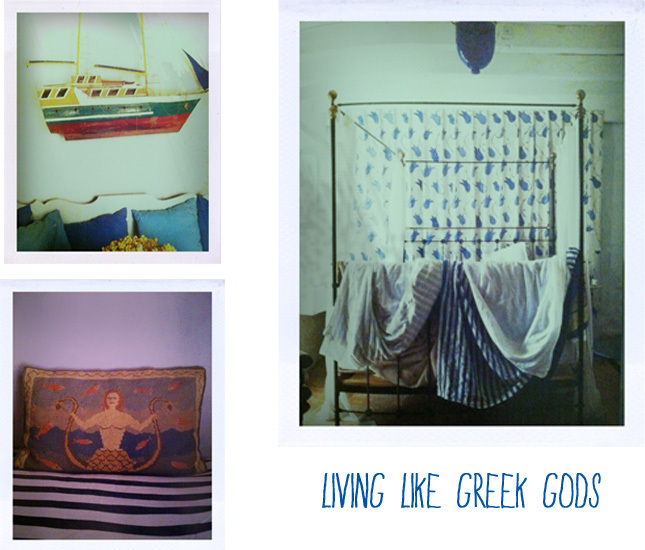 Moreover, I love the references to tradition in Greek homes. Old, family heirloom icons, earthenware, oriental fabrics - all these elements make a matchless blend of fine home decor and an exceptional approach to unintended interior design. Here I am. After almost a year of networking, scooping, pinteresting, tweeting interior design & home decor topics I finally have a digital home to call it my very own ‚happy home’. Just as we're able to transform a house into a home with a distinct interior design that reflects our personality and taste, I did my best to convert this digital house into a very personal digital home. 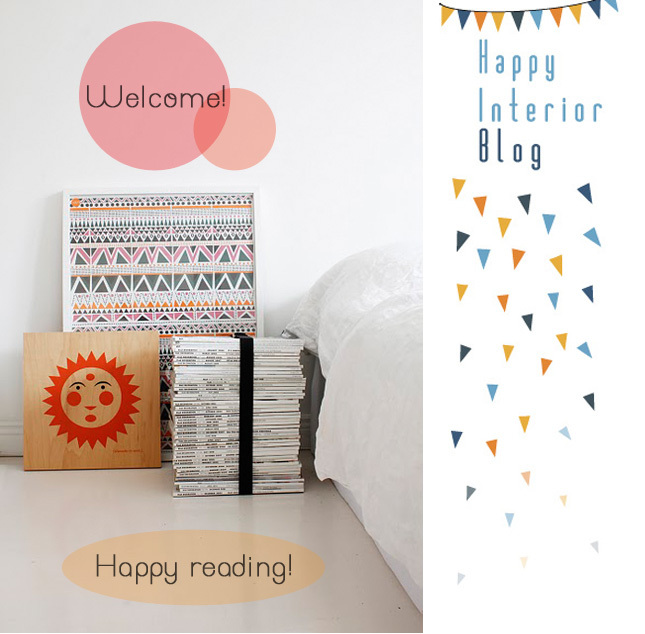 And this home has a name: Happy Interior Blog. Why this name? Above all because I am a very happy person in general. 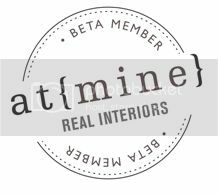 Hardly ever in bad mood, almost never cranky, and when it comes to interior design and decoration topics my happiness reaches its peak. Thus, I thought this very plain and simple title suits best. Not only does the topic make me happy, but I am also very happy to welcome you in my new digital home. I hope you will become a recurring guest and you’ll take a little bit of happiness with you every time you come and visit me. 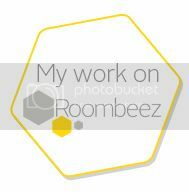 I won't spend too many words on reasoning my existence in the bloggosphere. I am here because I felt this is the right thing to do and I am sure I will find my little niche. Moreover, I was so inspired and encouraged by many of you during the past months. Thank you for that. You made me happy! Now it's time to give back. I want to make you happy. 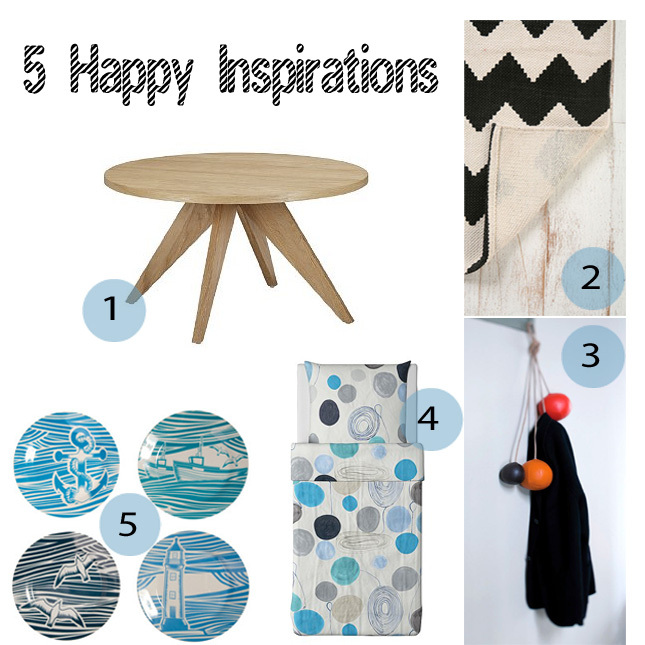 On Happy Interior Blog! Happy reading!